How marvelous! We recently sighted a flowering Yucca aloifolia for the first time, on June 30th. Not from our own top-heavy potted plant which has been residing at our front yard since year 2005. Humph… I wonder whether it’s about time to bid it sayonara? Spotted this pure white blooming beauty in the vicinity of the Cheras Leisure Mall, Kuala Lumpur but the tree was too high to truly enjoy the clustered flowers at its crown. Just have to be contented with the zoomed in images that were uploaded onto our iMac! And, surprisingly, four days later about a mile away, we came across another flowering Spanish Bayonet! Simply amazing! 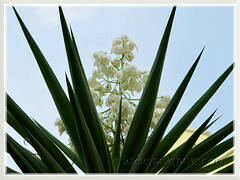 We’ve been wanting to see the Yucca’s flowers for so long and suddenly it seemed to be popping around everywhere within a span of less than a week, specially for us, as it were! The robust Spanish Bayonet or Aloe Yucca is primarily grown for its ornamental foliage which displays a striking architectural form that’s both impressive and captivating. 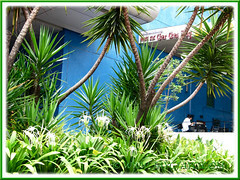 Hence, not surprising that this decorative plant is very popular and widely used in landscape design. Etymology: The species name, aloifolia means with aloe leaves in Latin. Origin: Native to southeastern USA, from North Carolina to Mexico and the Caribbean. Naturally found along the sand dunes of coastal areas, in pine forests and on the margins of brackish marshes. Plant type: An ornamental evergreen shrub. 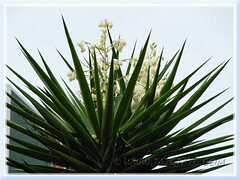 Features: Yucca aloifolia is a well-known perennial species of the genus, Yucca, that comprises of 49 species. It has an erect and stout trunk, 3-5 ins (7.6-12.7 cm) in diameter, with height ranging between 5-20 ft (1.5-6.1 m) and a crown spread of about 4 ft (1.2 m) wide. The cultivated plants are slow-growing and mostly seen below 10 ft (3.05 m) tall. 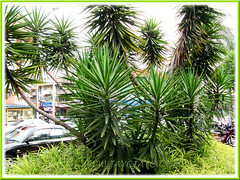 It’s an evergreen tree-like shrub with attractive medium to dark green strap-like leaves, 2 ft (0.6 m) long. They are spirally arranged, rosette-like along the woody trunk which becomes clearly visible when the older withered leaves are discarded. The tough leaves are leathery and rigid, with sharp terminal spines in dark brown, and are sand-papery or mildly serrated along their margins that can be felt when your fingers glide over. As the plant matures and age, the older leaves will droop and eventually turn brown and wither, and spots a top-heavy trunk that is sometimes branched. Spanish Bayonet tends to produce pups or offshoots at the base of its trunk, forming a colony eventually. 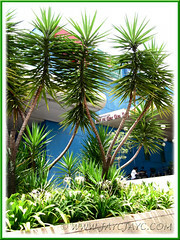 It’s quite similar in appearance to Yucca gloriosa (Spanish Dagger) except the latter has a shorter trunk and mound-like with leaves that are less stiff, arching and with smooth edges. Above the bushy foliage crown at terminal tip, will emerge a handsome 2 ft (0.6 m) tall flowering spike. The branched inflorescence bears masses of white, sometimes purplish-tinged pendulous flowers that open at night and exude a strong fragrance. The inflorescence is strikingly beautiful against the backdrop of dagger-like green foliage! Unlike other Yucca species, Yucca aloifolia does not require the Yucca moths of the family Prodoxidae to assist in pollination as its flowers are hermaphrodite, self-fertile and will set fruits and seeds easily. Like Agave desmettiana, it is monocarpic and its individual crown will die after flowering but not before producing a couple of sideshoots to perpetuate the growth. 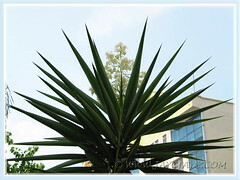 Culture (Care): The robust and hardy Yucca aloifolia grows easily with minimum care. Light: Prefers full sun though thrives well in partial shade. Moisture: Low to moderate water needs and is drought tolerant when well-established. However, it thrives best with regular watering during the hot seasons. Soil: Prefers poor, sandy loam and well-drained soils, though adaptable to a wide variety of soil types. Others: Since it is known to topple over sometimes at heights above 8 ft (2.4 m), best to support it with a stake or prune down the taller trees if necessary. Moreover, pruning will encourage new shoots to sprout from the trunk and even induce offshoots to emerge from the base. Besides, you can use the cuttings to propagate new plants. Remove the brown and withered leaves to keep it aesthetically attractive. Feed it once monthly with a balanced fertilizer. It is generally free from diseases and pests. For subtropical and temperate regions: Hardiness: USDA Zone 8-11. It is frost hardy and can withstand temperatures down to 23°F (-5°C) without protection. Some UK gardeners have claimed that Yucca aloifolia is hardy, even down to 0°F (-18°C). In non-hardy regions, best to grow it in a large pot, located outdoors in summer and indoors during winter. To propagate by seed germination, sow them indoors before the last frost or direct sow in the ground after last frost. Propagation: Propagate by seeds that germinate between 1-12 months, cuttings that root easily in soil, or separating offsets (pups) that emerge from base of trunk and rhizomes. 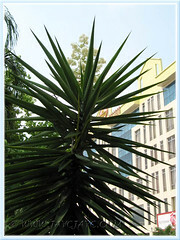 Usage: Yucca aloifolia makes an excellent decorative plant in any landscape design. Grow as a dramatic accent in the garden or in borders and beds, amidst a mix crowd of low-growing flowering and foliage plants. 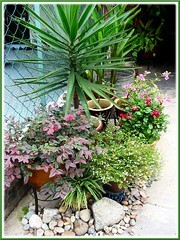 It’s as lovely for container planting because of its slow growth habit and compact appearance. With low water needs, it’s ideal as a xeriscape plant for rock and desert gardens to display its stunning architectural feature. Besides, Spanish Bayonet has edible parts, namely, the fruits and flowers that may be eaten raw or cooked, while the flowering stem can be cooked as a veggie like asparagus. The fruit is traditionally used as a purgative in certain regions. Other uses include the making of baskets, mats and ropes from the fibrous leaves. Edible flowers, that is truly beautiful to have it in a salad. Truly a beautiful bunch to adore. I often seen these near my workplace, they tend to flower but eventually end up dying, not sure whether its a last stage of life-factor kindathing, especially when they go leggy and unattractive. Too beautiful to relish, huh! You’re right, James… it’s been mentioned that this plant is monocarpic i.e dying after flowering and fruiting only once. Your description of it being leggy and unattractive best describes the current stage of our 6-year old potted plant, so you can deduce why I haven’t included an image of it here… hehe!